The Men's House at Fedraey. 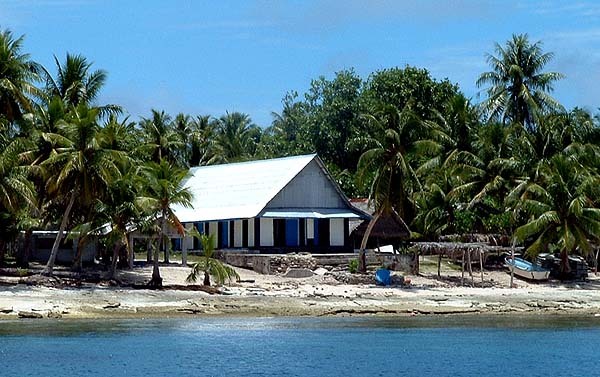 “The major purpose of the Men’s House,” Chief Taithau explains, “is that whatever comes to the island by sea, whenever a boat comes to this island, there must be someone from the boat to come to the Men’s House—directly to the Men’s House. They must come from the boat to the Men’s House to report the purpose of their visit. If they don’t do that, then the boat is automatically placed on what was called ubud. That is, we confiscate the boat. And to release that, you have to pay lavalavas." “That is also the meeting house for the men who don’t have wives,” Chief Yatch adds. “Young men, they stay there, sleep there and during daytime they just go around. "Inside the house is also a place for dance, for practicing and all of those things. Just like at the Women’s House." The Men's House at Asor. “Men’s House is strictly for men” Chief Taithau affirms. “Strictly, strictly for men. There are occasions where the men can ask the ladies to come to the Men’s House for a very important meeting, whether about the culture, traditional, or something very serious. Only then can the women can come to the Men’s House. “Only older women can walk in front of the Men’s House there” Mariana says. “If you’re carrying a child, you didn’t cross in front of the men’s house. Until the child can walk, can hold your hand and walk across there. Younger women don’t cross there." 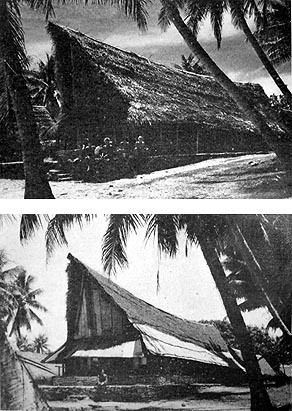 The Men's House on Mogmog in 1948 (top) and 1960 (bottom), right before it was hit by Typhoon Ophelia. From Lessa (1964). 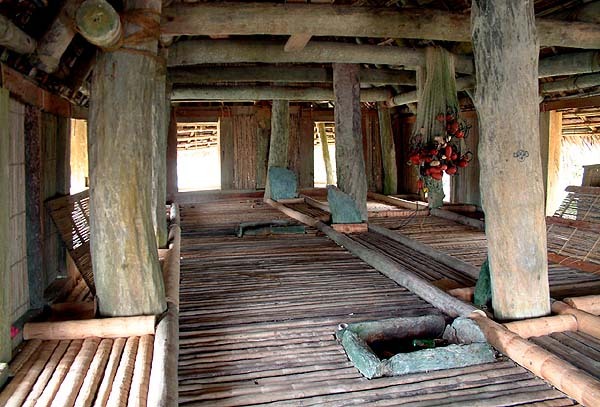 Interior of the Ayen Men's House in Rull, Yap Islands. "When I was young, you got up in the morning, first you came to the Men’s House," Juanito recounts, "and we’d sit and talk. When I came I would stay at this side. All the young men stayed down here and talked. And the older people would sit on that side. The young men sat down at the ocean end and the old men at the land end." "And then we talked here and whatever comes back from that end down here, that’s what we’re going to do. And they’ll say ‘Okay, you guys go fishing,’ and we’d go fishing. We have to change the roof attached to the canoe house, then that’s what we’re going to do. But it has to come from that end. "Every day, every morning, this is where it goes out from—whatever will happen that day will comes out from here. And when they meet at that end, things that they plan that night, then someone brings the information down there. They talk about it and then they pass it down here, and then we do it." The Ayen Men's House was destroyed by a typhoon, but has been recently rebuilt. 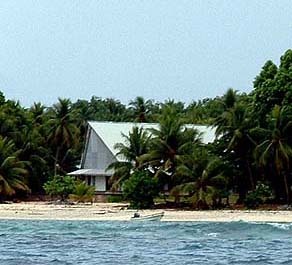 The Men's House at Mogmog, 2003. “Now we have a concrete Men’s House," Hosay says. "But we tried to imitate the local style, the previous one that was brought down by the typhoon. 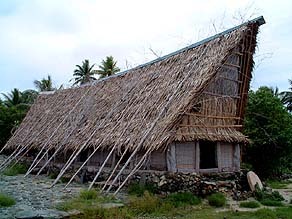 The local style, if you see those Men’s Houses in Yap, it looks almost like that. Before, each island tried to make a very big Men’s House and a fancy roofing, to compete. Just like that. 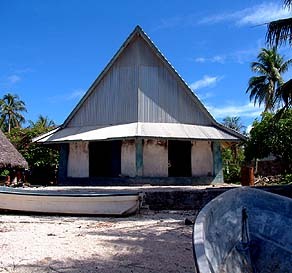 The Men's House is an important focal point of the interface between the community and the lagoon. Steve told us in the Come Ashore page how the navigator must remain in the Men's House at the completion of a voyage. The men here also watch the lagoon for canoes that might trespass into their waters. This we will hear more about in the Sea chapter. Building generally houses is a men's activity. Click here to learn about the construction of local-style houses. The Men's House on Mogmog is also one place where the distribution of goods takes place. And to understand who takes part in this process, we turn to learning about the Mtaang Daeyif.